Graduation photos and videos have been trending on social media this past week, following graduation season in the country. 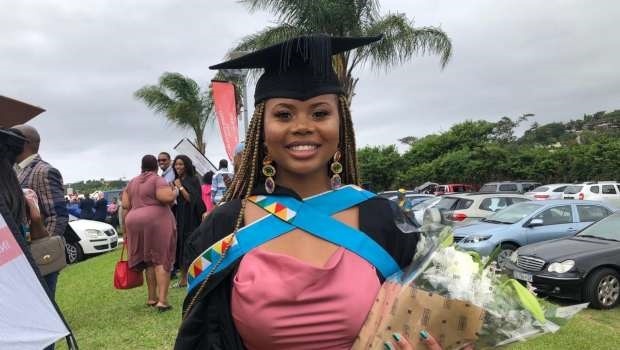 Even though the most excited graduates seem to be the black graduates hailing from the University of KwaZulu-Natal (UKZN), it is generally black students across the country that seem to be more emotional about obtaining their qualification. For many black, young South African students, to merely enrol for university is a battle. Many of them come from impoverished families and cannot afford to simply register for a course even though they qualify and have passed with distinctions. Over and above registration is tuition fees, textbooks, accommodation, toiletries and groceries. The National Student Funding Aid Scheme (NSFAS) is there to help students at their time of need but unfortunately cannot help everyone. Students are forced to find funding and bursaries which isn’t always easy. The newly graduate says she excited to finally complete this tough journey to graduation. “I was raised by a single mom and everything was on her. My mom is in catering and the business can be unstable. You can have months where earthing is booming and spend the next year with very little business. My uncle had to come in from time to time to help out with rent and groceries,” she says. In her second year Phumeza also suffered emotionally after taking the step to meet her father for the first time. “I had had a telephone relationship with my dad for years and he was amazing. Meeting him in person was a completely different experience, he wasn’t the person I thought he was. He was cold towards me and made me regret taking that step towards meeting him,” she explains. The experience was painful for Phumeza so much so, it affected her studies causing her to fail one of her modules. “I had to deal with that pain on my own and get myself up.” Phumeza doesn’t have a close relationship with her dad thanks to that experience but has since moved on. The young lady has registered with the University of Pretoria and has enrolled for yet another course. She is currently studying towards her a law degree, a plans to be a lawyer.